Goa Management Association celebrated Management Day 2018 on Saturday, 24 February 2018 at the SS Dempo College of Commerce & Economics Auditorium, Cujira. 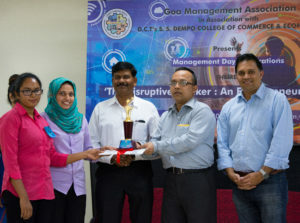 GMA celebrated the day in association with the BBA Department of SS Dempo College of Commerce & Economics, Goa, who hosted the event at their college premises. The theme of the event was The Disruptive Thinker: An Entrepreneurship Model. The event started with a formal inaugural ceremony where the traditional lamp was lit by Dr. Pradeep Salgaonkar, Chairman, GMA, Dr. Radhika Nayak, Principal, S S Dempo College of Commerce & Economics, Dr. M S Dayanand, Professor, GU Department of Management Studies and GMA Executive Committee member, Ms. Sonya Angle, Coordinator, and other faculty members of BBA Department, SS Dempo College. It was followed by an inter-collegiate presentation competition among students from several undergraduate management colleges on the day’s theme. Several teams participated enthusiastically in the competition and were cheered on by their college mates. This competition that tested the knowledge, awareness and creativity of the students, through their presentations, was judged by a panel consisting of Dr. M S Dayanand and Dr. Pradeep Salgaonkar. The presentations were followed by the formal talk wherein the guest speakers for the day spoke on the theme. The two speakers, Mr. Milind Prabhu, CEO & MD of Genora Infotech Pvt Ltd and Mr. Ganesh Faterpekar, Founder, Counterfeit IQ, addressed the audience shared their real life journey towards entrepreneurship. Their talk was followed by a panel discussion where the two speakers were joined by Mr. Yatish Dempo, Trustee of SS Dempo College of Commerce & Economics and Director, Dempo Shipbuilding & Engineering Pvt Ltd and Dr. Pradeep B Salgaonkar. The discussion was moderated by Mr. Harshvardhan Bhatkuly, Vice Chairman, GMA. The results of the student competition were declared after the panel discussion and the awards distributed to the winners. MES College of Arts & Commerce, Zuarinagar, Goa, were the winners of the presentation competition and the runners-up were SSPES’s Goa Multi-Faculty College, Dharbandora, Goa. Both the teams received their awards from the dignitaries on the dais. All the participating colleges too were presented certificates at the end of the program. The program ended with presentation of mementos to all the speakers and dignitaries present on the dais. Ms. Sonya Angle, Coordinator, S. S. Dempo College of Commerce & Economics, BBA Department, concluded the event with thanks to all concerned. The event was compered by Mr. Moses, a student of the BBA department of SS Dempo College of Commerce & Economics.